"Weighing only 12.7 kg (28 lb) which was around half the weight of other machine guns of the era, the Lewis became immediately popular amongst troops." Invented by U.S Army Colonel Isaac Newton in 1911 and based on initial designs by Samuel MacLean, the Lewis Gun was at first, overlooked by the U.S Army and instead taken up and put into production by the British. Produced at the BSA factory in Birmingham and cheaper and more economical to produce than a Vickers gun, the Lewis soon gained popularity with British, Belgian and Italian armies as an infantry weapon. Later on, the Lewis Gun also became one of the most important aircraft machine guns of the first world war. The BSA factory alone made 145,397 of these weapons during WWI. Weighing only 12.7 kg (28 lb) which was around half the weight of other machine guns of the era, the Lewis became immediately popular amongst troops. It could be carried by a single soldier and was easy to load with its drum magazine. Its cyclic rate was approximately 550 rounds per minute. Being gas operated, a portion of the expanding gases was tapped off from the barrel. This drove a piston to the rear against a spring. The piston rod carried an upright 'piston post' which engaged in a helical slot in the bolt so that as the piston moved back the bolt was first revolved to unlock and then drawn back. 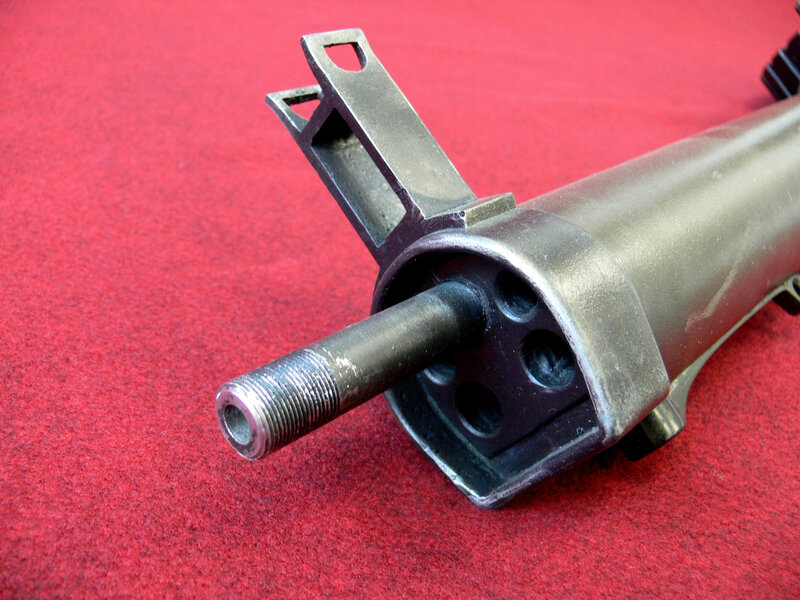 The firing pin was attached to the post, and struck the cartridge as the piston reached its forward position. Designed with an aluminium barrel casing which used the muzzle blast to draw air into the gun and cool the mechanism, there is some discussion over whether the Lewis Gun ever needed such a system. Early British Mark IV tanks adopted the Lewis gun and it became popular on British fighter aircraft either as an observer's or gunner's weapon. It was also important in its role as an additional primary weapon to the more common Vickers. It proved to be impossible to synchronise and fire through a spinning propeller due to its open bolt firing cycle. Because of this, the Lewis was fitted on SE5as above the top wing in a foster mount, outside of the propellers arc. This allowed the gun to be swung down on a rail to allow the magazine to be changed in flight. It was also mounted in a Scarff ring for aircraft gunners, enabling the weapon to be rotated and elevated whilst supporting the gun's weight. Many claim that the Lewis is the first machine gun to be fired from a plane. The Lewis gun utilised two different magazine types, one holding 47 and the other 97 rounds for aircraft use. 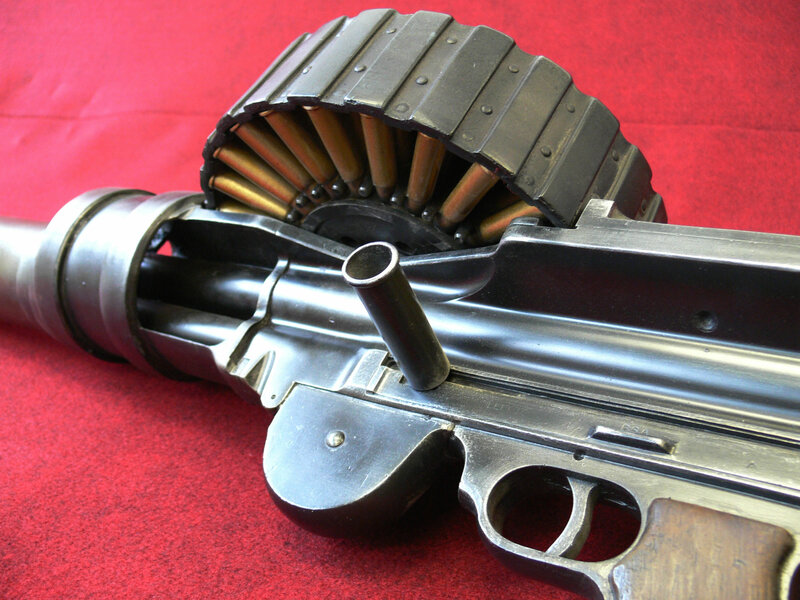 The 97 round drum magazine was considered too heavy for infantry. The aircraft type of magazine had to stored carefully when stored on ground mounts as it had an open underside which left it vulnerable to dirt and dust. 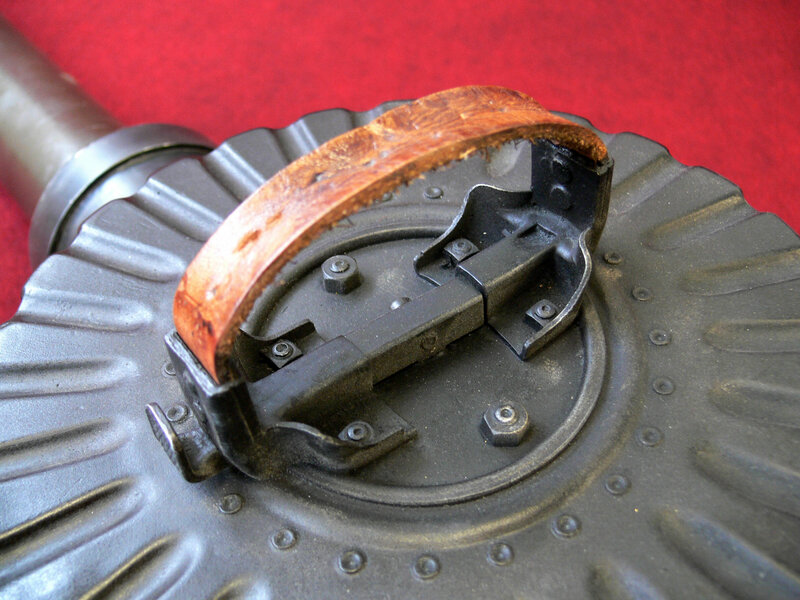 Unlike other drum magazine designs, the Lewis' drum was not wound against a spring but was mechanically driven by a cam on top of the bolt which operated a pawl mechanism through a lever. Adaptions of the Lewis Gun were really only made for aerial use. The MKI from November 1915, was different only by its spade grip and two-tier magazine. When the forced-draught cooling system was dropped, the converted MKII and newly made MarkIII of May 1918 were variants of the MKI offering a higher rate of fire which was achieved by modifications to the gas operating system. The MKIII Savage gets it name from Savage Arms Company of Utica in New York State. Savage obtained the license to make the Lewis gun from the Birmingham Small Arms Company in 1915. Through its American manufacture, the Lewis gun was also used in the border wars of 1916 between the U.S.A and Mexico. 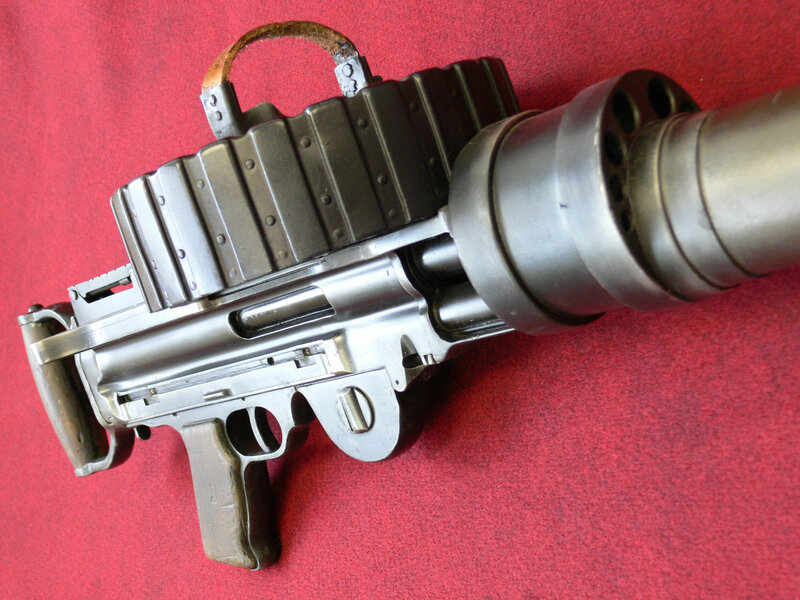 Feed system: 47 or 97 round drum magazine.